possible cave bearing sinkhole, originally uploaded by Mic2006. It seems that the cave geography repeats itself. 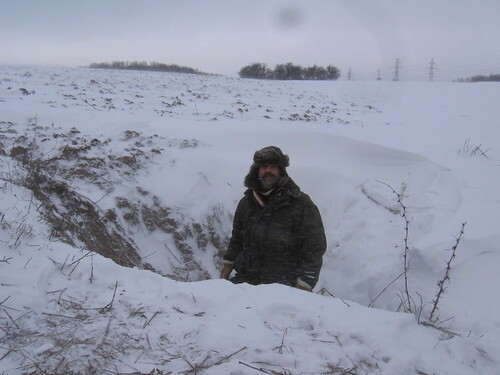 To a farmer it is a curse but to me this sinkhole is very much like the Blue Barrel Sink and as you might already be aware, there is cave tunnel beneath Blue Barrel sink. and again, just like blue Barrel sink there is the surface depression that connects to the nearest sinkhole in the patch of trees in the distance. 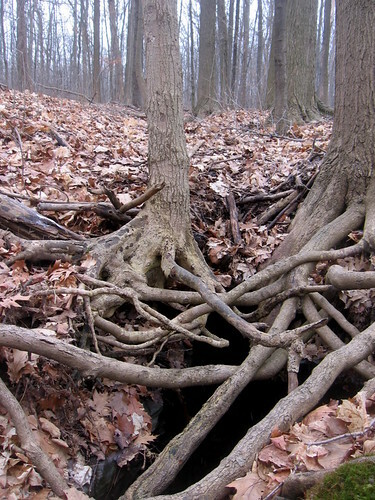 Ontario’s karst geography is screaming “CAVE” and so few can hear the noise. Put your ear down in the bottom of this sink at springtime, when the snow is melting and if you can hear the same roar that JC and I heard from the river beneath Blue Barrel, well then you know to dig and you’ll open up a cave. This whole are is pocked with sinkholes, but most are taking surface streams. This steep sided cone-shaped sinkhole seems indicative of soil being eroded from beneath. If you are searching for caves in Ontario, this is a very good indicator that there is a tunnel below. I think that those larger tear drop sinks that take small streams are seldom home to larger tunnels, but where the tunnels all meet up underground in a single trunk passage, that is the real prize. Without apparent surface flow, these dimples in the field are likely to be your most profitable use of time – they are eating soil because there is water flowing beneath. Wolf or Coyote – cave hunting, originally uploaded by Mic2006. As mentioned in a previous post, courage or weather withstanding JC, Wolfmaan and I would be exploring virgin tunnel this last weekend. Well a failure on all fronts. The weather around the Wasteland Waterway Cave was just outrageous and, additionally, my courage failed as well – I have said it before, and I’ll say it again, I am by nature a coward. As for an outdoor adventure in Ontario, it would not be happening that day. I imagined leaving Wasteland Waterway after crawling underground sometimes in water, sometimes not, and then trying to strip off that freezing slippery neoprene in blizzard-like conditions and well, to be honest, looking at the blizzard, it was hard to face the elements and we postponed cave exploring until the weather gets a little warmer. Having traveled through some very poor road conditions that morning in my Hyundai Accent to meet JC down the Home Depot – our usual meeting spot – we didn’t have the heart to entirely waste the day so we went out anyway just to follow some likely cave leads. 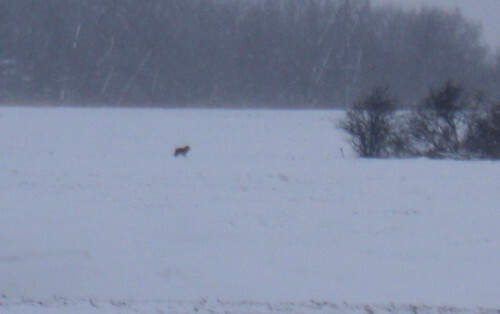 Trudging over frozen plowed fields and drifts that were blowing and at times created virtual whiteouts we saw this wolf or coyote thing that was running between small patches of forest to evade us. It was not so much the forest that interested us but rather the sinkholes around which they clustered. By aerial photos JC had identified several teardrop shaped patches by which we have come to expect the terminus of a disappearing stream. Wandering into one such depression it looked familiar and soon I came to recognize the now forgotten site of XS Wire Cave. On a similar freezing day several years back we had broken through a layer of rock and immersed in water I had crawled along a tunnel in possibly some of the most painful caving that I had ever done. The tunnel was short but at 20 below the conditions were abominable. 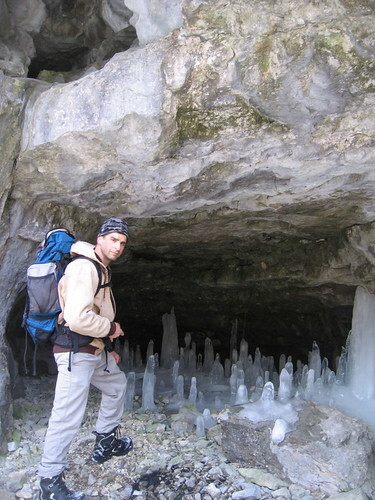 My book on caves, Caving in Ontario; Exploring Buried Karst has a chapter that details something of that discovery and the experience of the steel porcupine quills. As for cave exploring, the exploration of XS Wire Cave had truly been a challenge. What is limestone?, originally uploaded by Mic2006. First and foremost limestone is a sedimentary rock. As seen in the picture above, it erodes and redeposits in fantastic and ornate ways. Limestone is made of the skeletons of corals and tiny sea creatures, but it can also be made of calcium based chemical precipitates. The colors of limestone are many and varied. It is most typically a result of chemical impurities, and when subject to heat and pressure limestone meta-morphs to marble; a banded and crystalline rock that is seen in some Ontario caves as beautiful swirling bands. As is the case of the Silurian age Niagara Escarpment, when calcium is replaced in part by magnesium, dolostone forms, and although it is similar to limestone it reacts entirely differently to water. Check out this amazing video on caves and karst landscapes. It speaks of how limestone is corroded, how sinkholes develop and what the impact of caves is upon geography – video on karst topography here. The different types of limestone are many and varied, but two broad classification systems govern the names you will hear them by. The Folks system considers limestone upon the basis of the composition of its grains and interstitial material, while the Dunham classification is more focused upon the texture of the rock. In relation to its cave forming potential, limestone in Ontario is situated in either the west of the province, deposited during the Devonian age and still as of yet hiding its caving potential beneath the thickly deposited glacial tills, or it it is found at the eastern edge of Ontario, at either edge of the lobe of the Canadian shield that juts southwards, down towards Kingston. Being situated at the outer edge of the former Michigan Basin, these eastern limestone’s are considered the most favorable in the province for the development of caves. 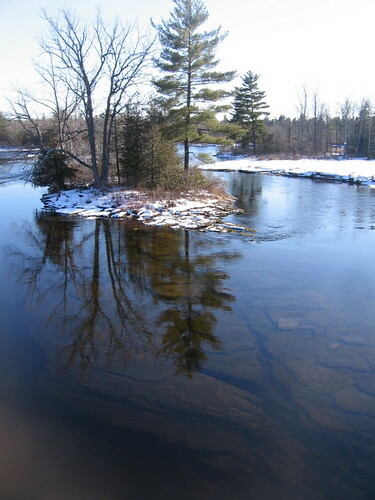 The most notable cave forming limestone’s are those of the Bobcaygeon Formation a rock of the Ordovician age. About 10% of all sedimentary rocks are classified as limestone. Other rocks that are commonly found inter-layered with limestone are sandstone, dolostone and shale. 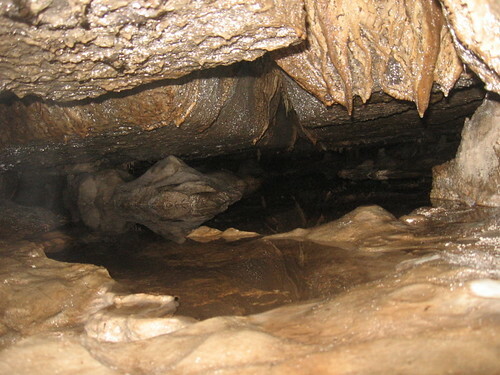 The presence of a shale layer is especially favorable to the development of caves. 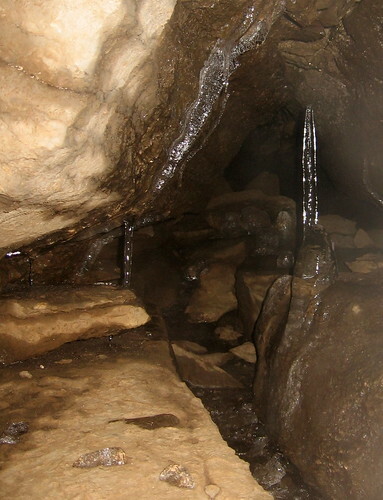 In our newly discovered cave – Wasteland Waterway we are expecting to come across a layer of the Rochester Shale soon. As shale is impermeable we expect it will change the nature of the system. To read more about caves and limestone in Ontario check out my newly published book on caves, Caving in Ontario; Exploring Buried Karst. In this book you will see mysterious tunnel systems that have developed in the limestone of the province. I also feature caves that have developed in marble and dolostone. There is a fantastic story of exploration that has remained somewhat unspoken of till now.